The theme for the WORK2015 Conference, New Meanings of Work sought its justification not only from the changes in work itself but from the global shifts both in the divisions and in the contents of the work. The ongoing turbulences of the post-recession economies at the global, regional and national levels shake also the work and its meanings. The on-going economic and societal changes are connected to forms and boundaries of work and to modes of working and ways of living that are yet to thoroughly mapped and explored. The recent transformations touch the very definition of what is work and call for rigorous explorations and new analyses. 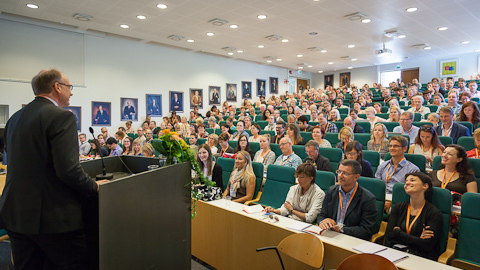 The WORK2015 conference explored the New Meanings of Work through five cutting edge plenary talks, two semi-plenaries and near 300 accepted paper presentations. The papers and posters were presented in altogether 26 streams with topics ranging from age to labour markets, from legal aspects to migration, from place of theory to affective capitalism and sites of work. You will find more information of the plenary talks and the programme on the sub pages. Hearty thanks to all plenarists, participants and sponsors. Your contribution made our conference a great success.